Running back Dalvin Cook’s anticipated return will happen Friday night against the Seahawks, but don’t expect much. Offensive lineman Mike Remmers will also play. Running back Dalvin Cook’s anticipated return will happen Friday night against the Seahawks, but don’t expect much from the elusive back in his first game action since the Oct. 1 knee injury that prematurely ended his stellar start to a rookie season. Cook will suit up and is expected to take a handful of snaps, but not play the entire first half like Kirk Cousins and the rest of the starters. Cousins will have his most complete complement of offensive talent to date with guard Mike Remmers also making his preseason debut. Right tackle Rashod Hill will also return from an ankle injury that kept him out of the loss to the Jaguars. Cornerbacks Mackensie Alexander (ankle) and Mike Hughes (undisclosed) are not expected to play. 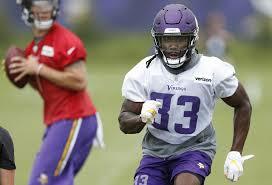 Neither are defensive end Everson Griffen (left leg), receivers Stacy Coley and Tarvarres King, safety Jack Tocho, guard Josh Andrews, and running back Mack Brown. Center Pat Elflein (shoulder/ankle) remains on the Physically Unable to Perform list and will not play. He has yet to practice and will unlikely take any preseason snaps before Sept. 9 against San Francisco. Receiver Brandon Zylstra, the Spicer, Minn. native and Concordia-Moorhead graduate, will make his Vikings debut against the Seahawks. Kickoff is set for 7 p.m. at U.S. Bank Stadium.